WONDER tells the story of Auggie Pullman: an ordinary boy with an extraordinary face, whose first year at school changed the lives and the perspectives of everyone around him. 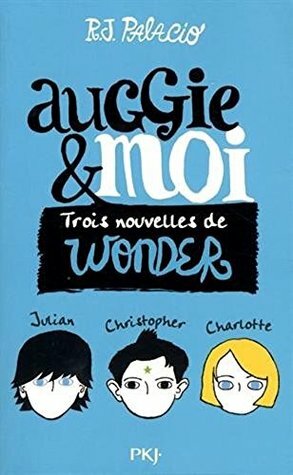 AUGGIE & ME is a new side to the WONDER story: three new chapters from three different characters - bully Julian, oldest friend Christopher and classmate Charlotte - giving an insight into how Aug WONDER tells the story of Auggie Pullman: an ordinary boy with an extraordinary face, whose first year at school changed the lives and the perspectives of everyone around him. AUGGIE & ME is a new side to the WONDER story: three new chapters from three different characters - bully Julian, oldest friend Christopher and classmate Charlotte - giving an insight into how Auggie has touched their own lives. Thought-provoking, surprising, infuriating, heartbreaking and heartwarming, AUGGIE & ME is a must-read for the thousands of readers who loved WONDER.